Dale Schroeder found himself on the ugly end of a string of incredible bad luck. In 2007, after 30 years of marriage, his wife passed away. Not long after that, he suffered a crippling injury to his arm in an accident on his farm. The injury was so severe that many of the bones in his upper arm had to be replaced with titanium. As if that weren't enough, Schroeder later lost one of his legs to diabetes. Schroeder worked at L&M Fleet Supply for 15 years before suffering from these injuries. He could not continue to work, and was forced to go on disability. As the troubles piled up for Schroeder, so did many of his bills, including the mortgage he owed on his farm through the banking giant JP Morgan Chase. Schroeder used all the resources he had available, burning up his entire 401K in an effort to keep making payments, but it just wasn’t enough. After a few missed payments, the bank started the foreclosure process. Schroeder was running out of options when he heard of an organization in Duluth called Project Save Our Homes. The Project Save Our Homes campaign took Schroeder’s case and immediately got to work, looking for various ways they could help him keep his farm. The campaign to save Schroeder’s farm was underway. The organizer's main goal was to convince JP Morgan Chase to renegotiate Schroeder’s payment options by working out some type of loan modification. The bank was not responsive, Schroeder said. Project Save Our Homes had to take it to the streets. 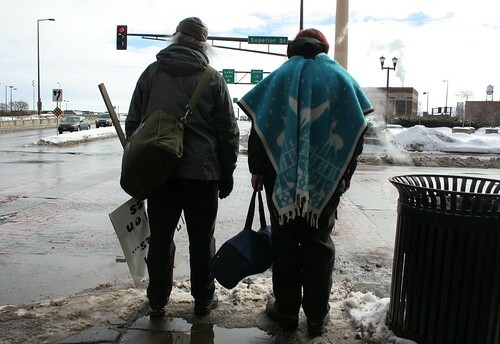 On Feb. 23, Project Save Our Homes organizers held a protest on the corner of Lake Avenue and Superior Street. Around 30 people gathered on the street corner and held up signs to show support for the cause. Cars honked to show support as they drove past the demonstrators. Schroeder himself, despite having a slew of mobility issues, was present at the event. 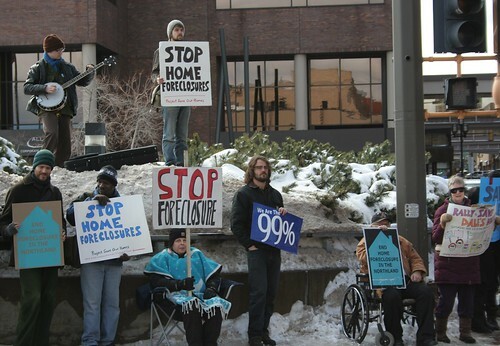 “[The bank] refuses to have a heart and sit down with the guy to renegotiate his mortgages,” said Adam Ritscher, an organizer with Project Save Our Homes who helped coordinate the demonstration. “He wants to pay his house off. He’s not asking for a handout, he’s just asking for some consideration for his situation." The main objective for Ritscher and Project Save Our Homes is to get the bank's attention by creating awareness of Schroeder’s situation and to have the bank take notice. This is not the first time Project Save Our Homes has brought about this kind of community action. The organization has achieved success in the past against banks that had local presence, such as Wells Fargo. JP Morgan Chase has no offices in Duluth, so reaching them is another story, Ritscher said. Peter Greenly is a lawyer who has been helping the campaign pro bono. He is part of the project’s intake committee, where he helps decide which cases the organization can feasibly accept, and he figures out the best ways to help. 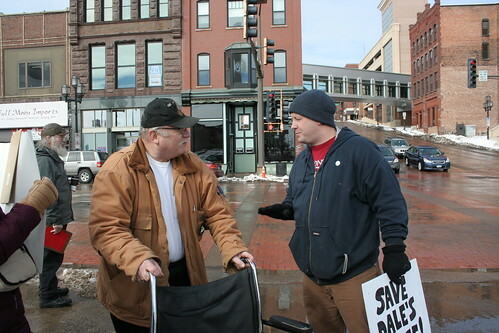 Duluth City Counselor Sharla Gardner was present at the protest to show her support for the cause. She said that she believes the banking system is failing people and causing undue harm to the community. The campaign to save Schroeder’s farm plans to hold similar protests every month in order to help raise awareness. After each protest, Project Save Our Homes plans on compiling pictures and press clippings as well as signatures and other supporting material to then send out as a package to the bank. The sale of Schroeder’s farm is set for July. If the organizers and the bank cannot reach an agreement, Schroeder will be expected to leave his property by August. As for Schroeder, he is remaining hopeful. “I hope to save the farm," he said. "Then I’m there for anybody else who’s out there in foreclosure."